The weekend is almost here and I’m really looking forward to it. I have a long list of things I want to get done so hopefully this hot weather (we’ve been hitting the 100s) will not wear me down too much. So to keep this short and sweet here are some things that are bringing me joy lately. The recent announcement of the Austin Book Arts Center. I can’t wait to join and take some classes. I already saw that they have an intro to letterpress class. I want to sign up right now but Fall is usually a busy time for me with work events, my shop vending events and holidays but this is so exciting. I’ll be sure to let you know after my first visit. Red garden shoes. No excuses for why I can’t go out and help my husband in the garden right? 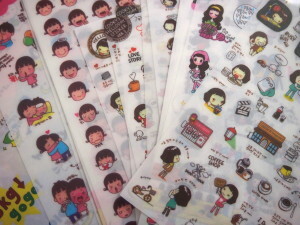 Cute planner stickers. I use a Filofax planner so I get a kick of out these cute stickers. Good also for just general journaling, to add to notes, etc. You can find tons of these on Etsy and Ebay. I have some from the Bonnie series and the Cooky Helloday series. Netgalley. I think some of Jenclair’s recent reviews have prompted me to checkout Netgalley more often. I don’t typically read a lot on my Kindle but being that we are going on vacation soon, I thought what a perfect way to check out some new titles and have plenty of books on hand. Finally, watermelon. Love, love cold watermelon during these hot days. Hope you have a fabulous weekend and let me know what you are enjoying lately. Ummm….yes, please, for watermelon. Love it. And I hadn’t seen the announcement about the Austin Book Arts Center. What a perfect place for you to take a class or two. Lovely. I’m hoping that we might have peaked for the hot this year, but probably not. Have a good weekend! Love the shoes! Load up that Kindle! Val McDermid’s and Kate Morton’s new books are on offer now. I get a lot of NetGalley offerings that are not that good, but there are some terrific ones as well that I would never even know about if I didn’t keep checking. I just finished The Faithful last night, and after a slow start, I couldn’t turn the pages (so to speak) fast enough. Started Morton’s Lake House this morning, and as usual, am engrossed. Happy weekend, the classes sound great for you. Gosh, don’t get me started on NetGalley. I love that site. And I’m auto approved by BookCouture, which just feeds my book addiction…lol. Those garden shoes are way too cute! You need a pair for sure! 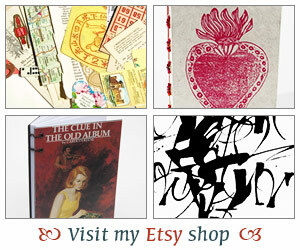 And I would love to take a book arts class–wish we had something like that here! I hope you will get a chance to take one eventually! Oh, to have more free time, yes?! Hope you had a great weekend! All those items on your list sound fabulous! Can’t wait to see what classes you plan to sign up for.